Weekly Head Voices #135: It’s all rainbows and unicorns, no really! 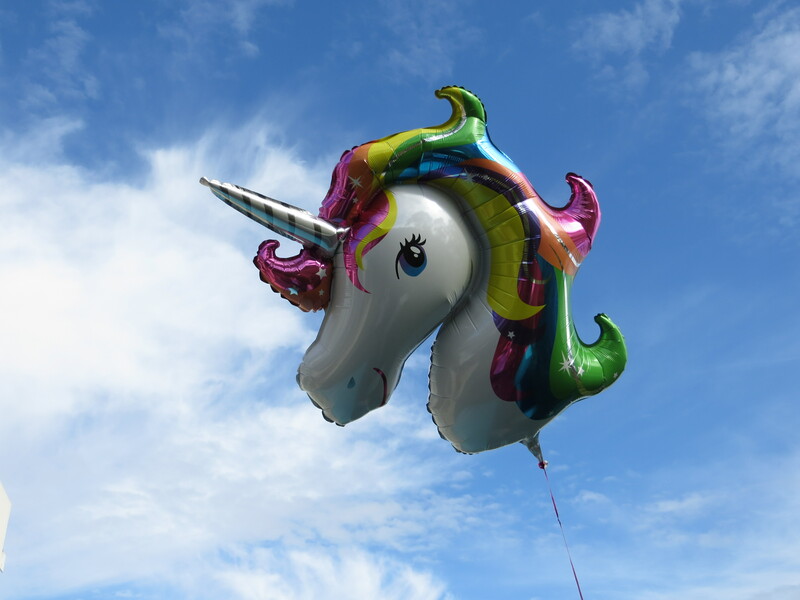 This rainbow unicorn, floating serenely on a cloudy background, is winking right at you. Down below, we are celebrating GOU #3’s second birthday. Photo taken with the expert assistance of GOU#1, age 11 going on 32. Hi there friends, welcome back to the weekly (!!!) head voices! I missed you. Releasing desktop software, even for a small group of people, can get tricky quickly yo! Yes, people still write desktop software, and we do love doing it. However, compared to web-apps, there are some additional challenges. One can’t easily roll-out an incremental fix while no-one is watching, because every release is a significant event where users have to go to the effort of downloading and installing your baby. It’s a fairly new product, so our release process is still being refined. Long story short, we caught a bug on the release platform (we develop cross-platform, but deploy for a single platform) shortly before release and so we really had to scramble to fix. This, together with the fact that the preparations for the release were already generally intense, left me quite frazzled by Wednesday evening after dinner. Lesson learned: In a cross-platform development, don’t allow any dependency version discrepancies between platforms, no matter if it causes developer inconvenience. GOU #3 turned 2 on Thursday. The littlest genetic offspring unit seems to be verbally well developed. She’s already using words like “eintlik” (“eigenlijk” in Dutch, “actually” in English) in fairly well-structured sentences. I have taught her to say phrases like “universiteit” and “lekker internet”, which she does with a smile. She is able to express her wants and needs at a level which exceeds that of some 30 year olds. Anyways, yesterday we held a birthday party for her. It was a fabulously enjoyable affair with far too many delectable delicacies, and more than sufficient amounts of craft beer and good wine (expensive local Chardonnay is my current preference, if you must know). It was beautiful to see so much of the family together in one place, all connecting like we humans should be doing as often as we can, but often don’t. Thank you little GOU #3, for everything. Trump / Brexit voters were scared. In my 2016 to 2017 transition post, I lamented the observation that for both Brexit and the Trumpocalypse, a lower level of education was the strongest indicator for a vote for leave and for Trump respectively. A new study by the Queensland University of Technology has now shown that in both cases the vote for Brexit / Trump was also driven by fear. It also makes the scary point that the respective campaigns deliberately targeted this fear, which is more than worrisome. Use this tidbit with care, or right before you were planning to leave the party anyways. A recent study published in Aging Cell, showed that older people who exercised regularly (in this case cycling), had the same levels of T-cells as 20 year olds. In other words, their immune systems are as effective as people a fraction of their age. If exercise was a pill, everyone would be taking it. It has wide-ranging benefits for the body, the mind, for our muscles and our immune system. John Carmack is the modern-day genius who was the lead programmer of genre- and era-defining games like Wolfenstein 3D, DOOM (“one of the most significant and influential titles in video game history”) and Quake. During working on these projects, he invented a number of important computer graphics techniques. It turns out that Carmack is not only a genius, but a productivity and focus monster. In this 2013 blog post, a colleague of Carmack at id Software describes how Carmack would apparently play CDs while he was working. If he was checking his email, or if he was interrupted by a colleague, or he needed to go to the bathroom, in other words, if he was not focusing on the core of his work, he would pause the CD player. By the end of the day, he knew exactly how much focused work he had done by how far he had gotten through his playlist. Compared to the interrupt-driven way programmers work today (thanks internet!) this sounds like an amazingly visceral way to recognise and signal interruptions in your flow: THE MUSIC SIMPLY STOPS. Would you be able to implement something like this for your work? Thank you very much for stopping by! Have a productive week, and don’t forget to exercise. < Weekly Head Voices #136: Slightly more than nothing much. Related posts: 🌤 The 2016 to 2017 transition post. 🌤 Weekly Head Voices #134: SCARF. 🌤 Weekly Head Voices #132: Potato deadline.